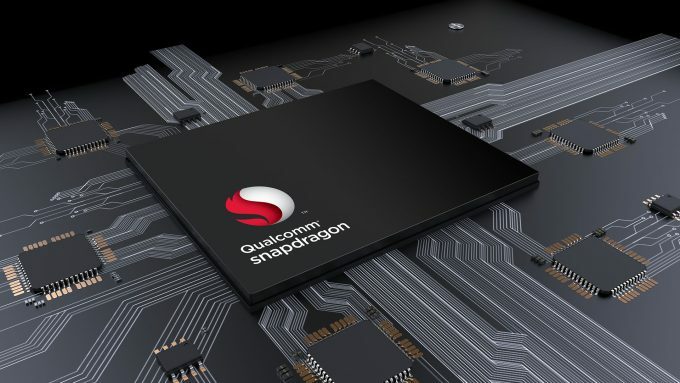 Continuing with the Tech Summit from Qualcomm on Hawaii, the new Snapdragon flagship SoC had its details released to the public, jumping from the current Snapdragon 835 that’s found in nearly every top-end smartphone, to the brand new 845 SoC. There are lots of incremental changes that we’d expect, such as faster CPU and graphics, but it’s all the little things that make the whole package a substantial improvement over the previous generation. With the CPU, it’s the same familiar configuration of 4 big cores and 4 little cores that’s in the current 835 chip, but this time with a frequency boost that puts the larger cores at 2.8GHz, with roughly a 30% boost in performance, and the smaller cores having a 15% boost. However, the cores have had their cache restructured so each has its own L2 cache with an additional L3 cache on top. 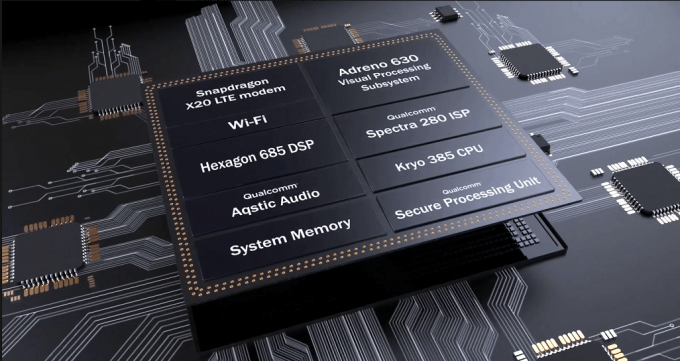 The Adreno 630 GPU didn’t have too many details revealed, which is unfortunately quite common in the mobile SoC world, but as we cover the rest of the SoC, it’ll become quite apparent that the GPU has definitely put on some weight (in a good way). While a faster CPU is expected, it’s the little things from the other features that will make the 845 SoC shine, and most of them center around the camera and VR. Since the Snapdragon 835 was released, there has been a large shift in what consumers want from their mobile devices. While we’re not out of the selfie craze yet, people do want more from their smartphones in terms of video and mixed reality. The amount of work that has to be done regarding graphics these days, is staggering. It’s got to a point where 1080p is no longer cool, and it’s all about 4K now. However, there has been a bit of a strange side effect from the uptake of virtual and mixed reality, and that’s refresh rates are now becoming important. The Adreno 630 GPU will be able to push 4K video at 60 FPS , but on top of that, display a split screen for VR of 2K x 2K (each eye) at 120 FPS. The icing on the cake comes from the ability to handle 10-bit color depth as well, for HDR10 UHD content. Qualcomm’s pride though, mostly focused on its Image Signal Processor (ISP), the Spectra 280. Now, this is something that we were told about before, and the demonstrations given were very impressive. We encourage you to look at a previous news story where some of the capabilities were shown, which includes real-time spacial tracking of hands, 3D reconstruction of scenes using depth sensing, and the rather cool motion compensated temporal filtering (MCTF) that eliminates noise in video by rebuilding data based on multiple frames. The ISP can handle cameras up to 32 Mega-pixels, or two 16MP cameras, at up to 60 FPS. It can do fanciful bokeh effects, operate with zero shutter lag, and other little things. On the video side of things, it’s capable of recording 4K UHD content in HDR at up to 60 FPS, and can do slow-motion at 480 FPS in 720p. What’s surprising is Rec.2020 color space support – and this is probably something that Red will be interested in. There is even support for HEVC or H.265 video playback in hardware. Another addition to the chip is an increased presence of machine learning hardware, a larger Hexagon 685 DSP. Now, you are probably wondering “why does a smartphone need machine learning and AI?” – and it is a very valid question. The terms AI, machine learning, neural networks, etc, get thrown around a lot lately, and quite often, it doesn’t have any real-world implications to consumers. With the increased presence of VR and AR (slowly becoming XR for miXed Reality), being able to see the outside world and understand what’s going on, requires a major shift in processing capabilities, which is where machine learning comes in. We can train a computer to ‘see’ different objects, but if you show it something that looks slightly different, it’ll probably fail to guess what it is. 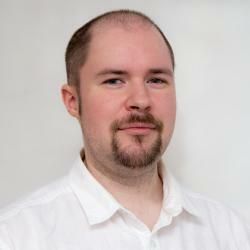 We need the computer to be able to better understand what the objects are, and this becomes important for XR where millions of people will interact with many different variations of the same objects – how many different shapes and sizes of mugs, chairs or tables are there? 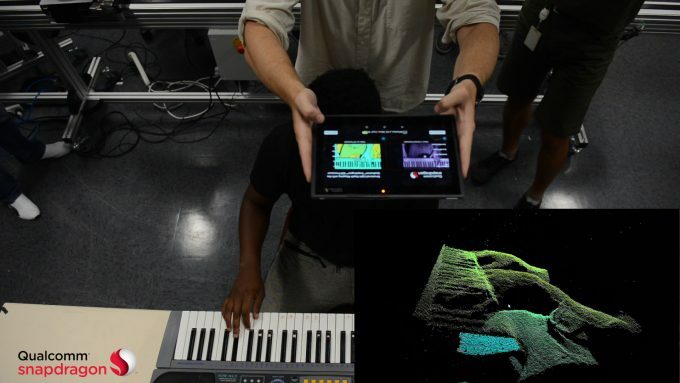 The Hexagon 685 DSP is meant to help with these neural network processes so that things like Project Tango and Daydream can work, as well as the 3D reconstruction and depth sensing shown in the previously linked article about Spectra. On the connectivity front, the new 845 SoC will support 802.11ad WiFi in the 60GHz range (think line of sight), which is the multi-gigabit wireless standard that’s soon to take off. There is also support for Bluetooth 5, so better power efficiency and throughput there as well. An interesting change as well is the inclusion of an X20 LTE modem, instead of providing it as a separate chip. External hardware will still be required, such as the various aerials, but a multi-carrier enabled modem will be built in, with support for 1.2Gbps down and 150Mbps upload. Quick Charge 4 is another new charging standard with compatible batteries and devices, that will allow a 50% charge to be completed in 15 minutes, but again, this will depend on the battery. 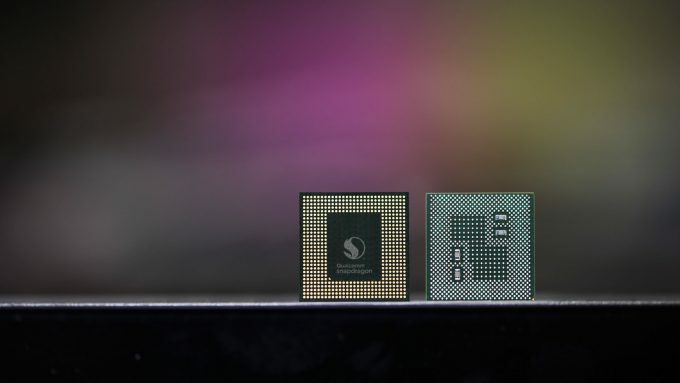 Overall, the Snapdragon 845 packs in a lot of features in a very small package, and companies are already lining up to integrate the chip into flagship smartphones and devices, including Samsung, Xiaomi and LG. Yes, this chip will be used in more than just smartphones. With standalone VR headsets becoming a reality, with the help of Qualcomm’s own reference designs, we also have a new generation of Windows 10 enabled notebooks and tablets to consider as well. Yesterday’s announcement from ASUS and HP both had Windows 10 devices using the current Snapdragon 835 SoC, but it wouldn’t be much of a stretch to see the much more powerful 845 being used in final retail units.